For some people, eating out is a chance to turn the brain off and enjoy. Not so for Lauren Daigle, 19. "My family actually makes fun of me when they bring the bread basket. If I know it's a restaurant that makes its own bread, I'll sit there and critique the bread," she says. "Yes, I do sit there, and I analyze the bread." Aspiring food reviewer? Obsessive carb counter? No - Daigle, of Vernon, Connecticut, is a baking-and-pastry student at Montpelier's La Brioche. There's more than a pinch of irony - maybe more like a dash or dollop - in the idea of a New England Culinary Institute student going out to eat at a local restaurant. This is, after all, a world-class culinary school that serves haute cuisine to both its paying customers and the students at its Montpelier and Essex campuses, who have three daily meals included in their tuition. Forget spaghetti and meatballs; at NECI we're talking foie gras and truffles. Of course, if NECI students ate all their meals on campus, they'd be the exception, not the rule. "People are eating at home less and less. The restaurant business is expanding," says George Malek, who as executive director of the Central Vermont Chamber of Commerce in Berlin keeps a watchful eye on business trends. "It's amazing to me just how much more people eat at restaurants than they used to," agrees Mary Rosholt, who teaches nutrition courses at NECI. "Today something like 40 percent of meals are eaten away from home." For NECI students, eating out offers convenience and a break from the rich school fare. Wannabe slumming? Perhaps. But eating out is more than an opportunity for stressed-out students to relax and socialize. It also gives them a chance to "study" - to case the joint, food-wise, observing what's on the plate and how it's being served. Like it or not, NECI students, young or old, are or soon will be card-carrying food critics for life. "It's definitely a curse at first," says 21-year-old student Sean Marcoux. "The first year I went out it was, like, you're almost scared. You're looking around the restaurant, and you're looking at the glasses. You've heard all these horror stories in class. You kind of don't want to go out - unless you want to spend $100." Now that he's almost finished at NECI, Marcoux says, "I'm not as critical. I'm not as much of a food snob as I was a year ago." Food snob? That term's a bit harsh. But there's no question that NECI students know their stuff; they're well on their way to becoming culinary wizards, leaving the rest of us meatloaf-and-mashed-potatoes folk grinning stupidly in their wake. Sherri Gilmore, NECI director of admissions, likes to refer to the 300 or so students currently enrolled at the school as "very dedicated foodies." She also describes them as "equal-opportunity diners" whom she sees frequenting the Langdon Street Café, Positive Pie 2 and McGillicuddy's Irish Pub. Class schedules and personal finances play a large role in when, where and how often a student eats out. First-year students tend to work the first half of the day: up at 6 a.m. and home by 3:30 or 4. For second-year students, the day begins around noon and winds down after 10. At that hour, however, their stomachs are still wide awake. "Do I go out much? A lot of it is budget," says Montpelier student Daigle. She says she and her friends eat out about once a week. They don't stray far, though, often ending up back at The Main Street Bar & Grill. (Off-duty NECI students get a 20 percent discount at NECI-run facilities, which include The Main Street Grill and Chef's Table in Montpelier and The Tavern and Butler's in the Inn at Essex.) "We mainly do it just because we know the students who are cooking and kind of want to see what they can do and how they've progressed in their abilities," Daigle says. For students at the Essex campus, the restaurant scene is altogether different. 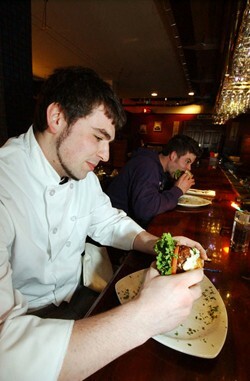 The Burlington area offers many more dining options than does Montpelier, provided students have access to a car. Bryan Andregg, 33, and his wife are determined to try as many restaurants as possible. "We're constantly trying new places to decide what our favorite restaurant will be," he says. As a first-year student with an early schedule, Andregg tends to eat dinner at home, but the couple tries to go out once a week, usually to slightly nicer restaurants, he says. In the six and a half months he's been in Essex, the Andreggs have sampled Taste, Smokejacks, L'Amante, Trattoria Delia, Bistro Sauce, Sonoma Station and Leunig's Bistro. Still on Andregg's list of places to try: The Bearded Frog< Bar & Grill, Starry Night Café and Black Sheep Bistro. Chain restaurants don't make the cut. "I just don't see a point in that," he says. "We go to places where the food is being prepared and cooked there, and it's not coming from a boil-in-the-pouch bag." Essex-campus student Gerald Peralta espouses a different philosophy. He's a fan of Moe's Southwest Grill - where he goes two or three times a week - New World Tortilla and Wendy's. Peralta is no junk-food junkie, however. He also frequents such upscale eateries as A Single Pebble, American Flatbread Company and Smokejacks; for the "diner experience," he likes JP's Pub and Al's French Frys. Needless to say, studying charcuterie by day doesn't rule out tracking down good burgers by night. Daigle says she and many of her Montpelier classmates head out to McGillicuddy's after getting off work late at night. Not only does its kitchen serve until 11 p.m., but burgers on the whole are a favorite of the NECI crowd - besides McGillicuddy's, they like the ones served at The Black Door and J. Morgan's Steakhouse. "It's a really casual-upscale sort of atmosphere," Marcoux says of J. Morgan's. Nowhere else in Montpelier really has that, except for the [Main Street Bar &] Grill, and you kind of want to get away from school." But not all burgers are created equal. Fast-food restaurants get a thumbs down from most NECI students. "Fast food isn't something that culinary students even consider," says Marcoux, who's wrapping up his last few weeks at NECI. "It's really not appealing anymore. I had been a fast-food guy before, absolutely, until I heard about the grades of beef they use, and after reading Fast Food Nation and seeing the documentary on McDonald's." How do you keep the discriminating diner from becoming a culinary Debbie Downer? "I don't want to go out to a restaurant and be the guy who says, 'I can't believe my carrot isn't exactly a quarter-inch on all sides,'" says Andregg, then draws an analogy: "It's really easy for introductory medical students to find that they're sick with every illness they read about. It's really easy for introductory culinary students to discover everything is not up to the standards we're being taught." All the same, Andregg concludes, "If the food tastes good, if the wine is good, and everyone's having a great time, then there's no reason to make your meal less than that because you are concerned that the potatoes have been cut in the wrong shape." For burrito-loving Peralta, the proof of a good restaurant is in the pudding, ambiance and companionship be damned. "I would prefer a quality restaurant that knows their market as opposed to a restaurant trying to be something that they are definitely not," he says. "I am content with a restaurant with good, quality food that is interested in showing off the food, the final product. Do not throw in all the side shows. Just cook the food, and make it the best you can."